You are here: Home � All Deals , Electronics: Computers Video Games GPS � Garmin nuvi 270 3.5" Screen GPS with both US and European Maps for $106.49. 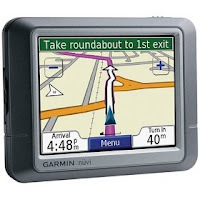 Garmin nuvi 270 3.5" Screen GPS with both US and European Maps for $106.49. Buy.com is selling the Garmin nuvi 270 - 3.5" GPS for $106.49. This is the cheapest offer we could find even for a refurbished model by over $30. This GPS has both US and European maps. Auto reroute with additional choice of route setup such as fastest time, shorter distance, off road, etc. The ability to make custom points of interest. It has a picture viewer. For travel it includes a World travel clock, measurement converter, and calculator. Garmin Lock which is an important anti theft feature. Customizable icons with touchscreen access. Look over some reviews and this offer by clicking here.